Khondokar Mohammad Rajin Saleh Alam was born November 20, 1983 in Sylhet. 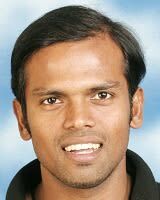 He is a Bangladeshi cricketer. He was the twelfth man of the inaugural Test that Bangladesh played against India on November 10, 2000. He then spent three years out of the national squad. He made his Test debut against Pakistan in 2003 when they made a trip to that country. He also made his ODI debut in that same series. During and after that series he proved himself to be one of the regular members of the national team. In 2004 ICC Champions Trophy he captained the side in the absence of the injured Habibul Bashar. He also made an unbeaten knock of 108 against Kenya to become the third Bangladeshi batsman to score a century in One-day Internationals. He was also a member of the national 2006 ICC Champions Trophy and 2007 Cricket World Cup squads. Rajin Saleh is one of the most talented batsmen in Bangladesh, and, as a man who takes pride in his physical fitness as well, he has also become a favorite of his coach, Dav Whatmore. Find Rajin Saleh profile and stats of batting, bowling and fielding including latest updated news of Rajin Saleh, videos and images at Hamariweb.com. Also find detail Player profile and career statistics of Rajin Saleh of Bangladesh. Rajin Saleh - Find Rajin Saleh of Bangladesh Cricket Team complete player profile, number of matches, runs score, wickets & catches, Statistics, Records, Rajin Saleh Latest News, Rajin Saleh Videos, Rajin Saleh Photos, and other Rajin Saleh Cricket Team players.